I am waiting for The Susans and so are the bees and other critters who visit them. They are just about to open! have a garden filled with sunny faces. Once they open it will be golden yellow with touches of lavender, blue and red all the time! That's how the author of a book on Tennessee wildflowers describes Black-Eyed Susan. Coarsely-hairy! It’s possible that some might find her a less than refined flower. It’s true she has rough leaves and sun-flowery face that might be off-putting. Really, she is just a bit hairy. The hirta in Rudbekia hirta refers to hairs and she has them! She is indeed rather hairy. You can clearly see the tiny little hairs along her stem. But coarse…that’s a bit much! I prefer to think of her as common. By that I mean she is one of the most popular of all wildflowers. She's found growing naturally in every state except Arizona and Nevada! She loves Canada, too! Maybe she doesn’t belong in every garden, but she is essential in mine. ...Black-Eyed Susan step ups to take a bow. Without this native annual/biennial/perennial my garden would look quite bare during late July and August. If I can keep her dead headed and sufficiently watered....she will be with me until the fall asters bloom. She's happy in almost any aspect, although, a sunny site with adequate water is preferred. She’s a taller plant in full sun; bushier and fuller in shade. One thing you need to know…she is a prolific seeder and scatters her progeny about the gardens with glee. She's found a home in a shadier bed at the base of Viburnum rufidulum. I leave her here to duke it out with native Columbine, River Oats and Hypericum; all vigorous self seeders. Don't you love her black eye~~we know it's brown, but don't tell her! It's a pretty cool cone. The dark cone or disk and golden petals are both florets. Floret is a term that's used with composite flowers. The best example of composite florets is broccoli! A large number of tiny flowers in a grouping that looks like one flower. In Susan's case it's a cone. The disk or cone floret is where all the faunal action takes place. The petal or ray florets are there to attract pollinators. She's wearing a pretty golden party dress to the garden party. She has absolutely no fragrance. But she doesn’t need fragrance to attract bees, wasps, flies, butterflies and beetles for pollination. 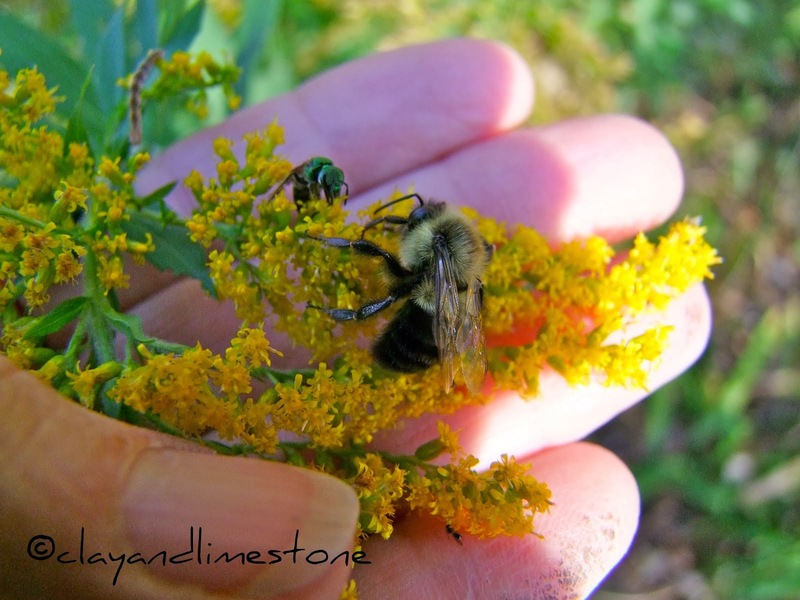 The bees take up the nectar and collect pollen along the journey. The caterpillar of silvery checkerspot feeds on the leaves. Finches occasionally feed on the seed, but they will fill up on the coneflower seeds first! 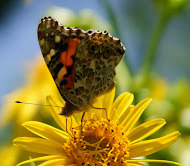 This member of the aster family's claim to fame are her sunny rays and dark center....but I celebrate her easy going nature, her long bloom time and her ability to tolerate shade. She may be coarsely–hairy, but she has her charms. Detail from A Tribute to My Susans! I love, love, love, Susans. I think they are one of the most cheerful flowers. I love seeing them growing on the side of the road. Beautiful mosaic, did you make it? Wow, it took me long enough to figure out Gail Tiles! 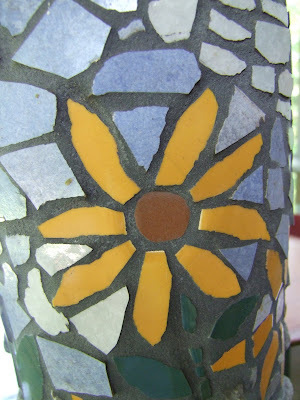 I love mosaics, I went into a shop one time the sold only made mosaiced furniture. I've been saving a pile of old china shards that I find in the garden, I'll have to do something with them when I get enough. You've inspired me! You are going to have a sea of yellow! My Susans are about to pop too!! Love the bright and sunny blooms. The Liatris looks great with them as well as the Coneflowers. You ain't just a kidding about a 'free' reseeder, (how I like to say it). We have these coming up in our lawn...... Love them. I have a photo similar to your first one that I named Waking Up. Looks as it she is stretching just like yours. Great post, can't wait to see them in full bloom. Hi Gail, this was the post that turned by back around to face the susans squarely and embrace them! They keep up the dance of the flowers until the fall belles arrive, and yellow is such a happy hue in the hot humidity of summer. You have made a good case for us all to have her grace our gardens. Won't be long now. I see some are opening. Can't wait! You'll have quite the show soon. You convinced me last year that I really needed some Susans to keep me company in the garden, so I did plant a few this spring in the new butterfly garden. No signs of buds yet, but I have my fingers crossed:) I would be happy if they re-seed themselves all over this area! This is truly one of our best natives. I am glad to see them being used in more and more commercial plantings. Today I saw a 7-11 that had planted loads of them backed up by some sort of dwarf miscanthus. I hope when your sea of Susans open, your camera will be there. A totally wonderful post. I love the Susans, too, and purple coneflower, as well; Rudbeckia fulgida is the stalwart in the meadow, with R. hirta popping up here and there in other parts of the garden. The best part is how much bees and butterflies like visiting the flowers, and the goldfinches like the seeds! I have a couple of big drifts of Susans too. She is the most forgiving and companionable wildflower out there. Never complains about the soil, weather or overcrowding. Indespensible in the late summer garden. Funny, I'm waiting on my Susans as well. They're just about to pop but it can't be too soon. It sounds like you have great conditions for yours. I'd love to see drifts of it but if I let it get its way in my raised beds, that's all I'd have! I love Susans too!!! I planted seeds and only maybe 12 germinated. They are tiny still so not sure they will bloom! Yours are going to be beautiful!!!! This must be what I see on the side of the road about this time of yr. They are pretty. Would like to "move" a couple into my garden. I too love black-eyed Susans and they are just budding here as well. I love how their buds look; one of my favorites. Hi Gail! I am probably the only one here who doesn't have Susan in the garden! Your post may change my mind. A prolific seeder. I like it! Excellent topic. Mine are still a long way from blooming. I'm making room for more of them. They make a big impact in the garden and nothing could be easier to grow. This year I have a mystery plant that was labeled 'black eyed Susan' from a plant sale. The leaves are different and it is already almost 30 inches tall. It will be interesting to see what this plant turns out to be. My susans are everywhere this year too. They are so tall. I love them. Your garden is beautiful already, can't wait to see it with the Susans open! It's going to be a great display/show this year Gail ~ worth the wait. Thanks for offering to bring the treats for tea ~ I would eat anything you decided upon. Wish I could sit in your garden for a spell too. It always looks most relaxing. Happy 4th of July if I don't get back here before then. I can't believe that my Susans are blooming before yours. They are prettier this year than I remember. I only have a few plants; I can't imagine how sunny and cheerful they will be when all of yours are blooming together. I'm sure you will be smiling in their presence. They are definitely a happy flower! Susans will always be welcome in my garden. They are all bright and cheery, and so carefree. I haven't had problems with disease or insects with them. Love your pics--you managed to capture her charm quite well. Thank you all for visiting and leaving a message...I am celebrating Independence day with my son...Yippee! A wonderful weekend to all and a Happy Fourth to those who celebrate! Be safe and see you next week. Gail, we are all waiting with you! I am so glad you reposted from last year, and that is one of my favorite photos also. It will be fun to see Susan showing her sunny faces all over your gardens. Hope you are doing well and have a wonderful 4th! i have some blooming out by my mailbos and they are so cheery. i really love them and wish i had some coming up in my wildflower meadow. maybe next year. have the happiest of fourths and be safe. The "hairy" Susans are my very favorite flowers in the garden. It won't be long and it will be Suddenly Susans at Clay and Limstone. Everything is just beautiful at your place. Lovely post, Gail. I'm smitten with my Susans also. Thinking of you on this lovely day ~ Happy 4th! Gail, I admire all your photos- you are not stingy when it comes to posting them! I'm with you.....Susan's are welcome in my garden wherever they pop up. I LOVE your mosaic...did you do it? That is something I have always wanted to try, but haven't got to it yet. IM waiting ,too..will it be anyday now? Gail--do your susans get black spots on their leaves? I lose them every year and am about to give up on this plant! Larry is popping some corn, so I am back. I'm glad I found this post. I love my black eyed Susans, too. They don't seed all over as much as yours do. Some of mine had a disease on them last year, so I thinned them out this spring, when there was no sign of any problems. The ones I moved and moved from look like they have it again. It doesn't affect the blooms, though. I'll have to check the ones by the garden again, but I don't think they have it.